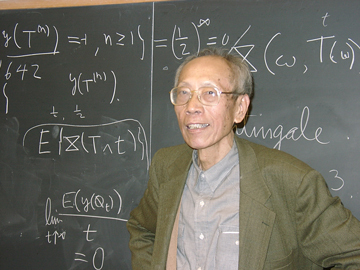 Kai Lai Chung, one of the leading probabilists of his times and Professor Emeritus of Mathematics at Stanford University, passed away on June 1, 2009, at the age of 91. An obituary is available by clicking here and a list of the publications of Kai Lai Chung can be found by clicking here. A Stanford Report article about Kai Lai Chung is available here. Kai Lai Chung: A Remembrance, Friday, November 6, 2009, 3-6 p.m., Mathematics Department, Stanford University. Special Session at the Seminar on Stochastic Processes, University of Central Florida, Orlando, Florida, March 11-13, 2010. From Markov Processes to Brownian Motion and Beyond: An International Conference in Memory of Professor Kai Lai Chung, June 13-16, 2010, Peking University, China. For conference photo, click here.